When we first got Big Blue, my plan was to make G a rain cover, a la Lindsay’s instructions. I already had the clip-off umbrella stroller sunshade and a big rain cover from our jogging stroller. I purchased the PVC, zip ties, and heavy duty Velcro, thinking it would be an easy project (I also liked that fact that it would double as a sun shade). I played around with it a bit, but I didn’t find it quite as easy to set up on the Yepp child seat as it seemed to be on Lindsay’s Peanut Shell child seat, plus, it was summer and there just wasn’t all that much rain (though the sun shade would have been nice). Since then, it seems like most of the days when it’s raining and we need to transport Gabriel, it’s really raining (with heavy winds and/or lightning and thunder in the mix), and we’ve opted to take the car. One drizzly day in March, I realized that the adult-sized poncho we bought at Crater Lake (when someone neglected to bring her raincoat on the hike (also, the hike where we almost got struck by lightning)) would make an ideal rain cover for G and his seat. 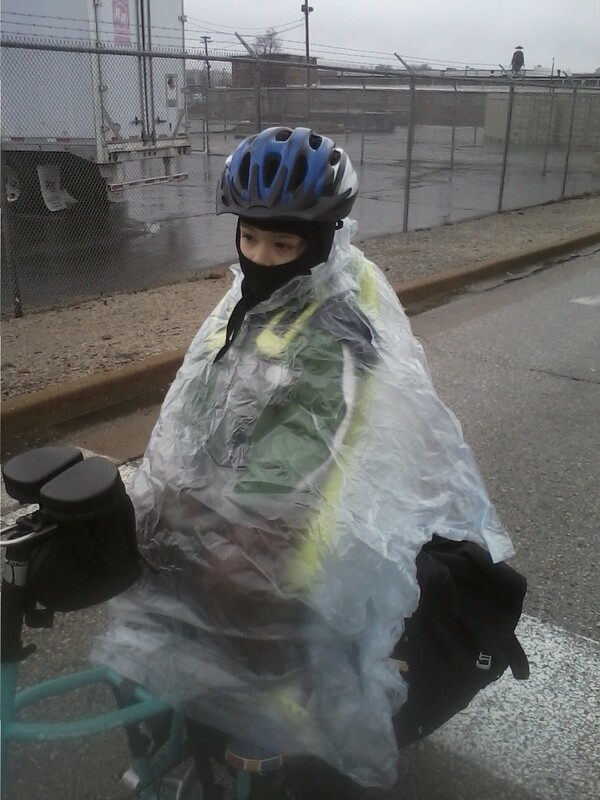 The poncho solution is as simple as securing the kid in the seat, then placing the poncho (with the child’s arms INSIDE, not sticking out), and topping with the helmet. To keep it from blowing around, I rolled the edges and secured them with a couple of clothes pins (you can see one near the bottom of the photo, behind G’s foot). We weren’t using the poncho’s hood on this day, because it was just a little drizzly, and cool enough that he was wearing other head covering anyway, but in heavier rain, the hood could be worn underneath his helmet, for head to almost-toe coverage (again, if it has really been coming down, he would have had his rain boots on here. We’ve used this successfully on a couple of wet days now. Yesterday morning was just such a day. It was sprinkling a bit as we all prepared to leave (me to a dentist appointment; M and G to school/work). As I was leaving for my early appointment, Gabriel was angling for taking the car, and starting to work into a bit of a lather (apparently he was sad that they weren’t leaving at the exact same time as me). I was floored. Really?!? My 3-year-old has to worry that other freaking 3-year-olds will MAKE FUN OF HIM??? At preschool??? My heart hurt for my sweet, sensitive little guy, and my mama bear instincts definitely kicked in — WHO, exactly, was going to laugh at him, because so help me, I was going to find that little punk . . . . The truth is, this stuff will happen. Not to condone it, but short of home-schooling my kid and never leaving the house, we’ll have to deal with this. Preschool seems a little early, but I guess it’s time to start practicing how we deal with these things. I’m pretty sure that peers would make fun of my guy too but I’m also pretty sure we need more kids like them to change the world. What does he say when you ask him how he feels about his attire? I definitely plan to have more of a discussion the next time he makes a comment like that. Didn’t really have the opportunity in this case. Love the photo. A friend of mine told me once that she cut a hole and put trash bags over the kids heads and let them jump on the trampoline while it was raining. As long as you are being active! !